The 2011 Medal of Honor Commemorative Coins will be issued to mark the 150th anniversary of the establishment of the Medal and recognize and honor the distinguished recipients. The Medal of Honor is the highest award for valor in action against an enemy force that can be given to a member of the Army, Navy, or Air Force. The program will include $5 face value gold coins and silver dollars. With a maximum authorized mintage of 100,000, the $5 gold coin will represent the original Medal of Honor with a depiction on the obverse. The reverse depicts Minerva, the Roman goddess of war and wisdom, who appears in the central design of the original medal. Designs are credited to Joseph Menna for the obverse and Joel Iskowitz for the reverse. The gold coins will have a weight of 8.359 grams, diameter of 0.85 inches, and composition of 90% gold and 10% alloy. Pricing and issuance information for the coin have not yet been established. 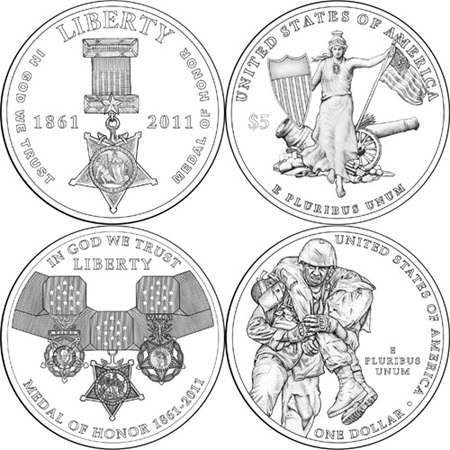 The Medal of Honor Silver Dollar features the three modern versions of the medal with ribbons. The medal for the Army, Navy, and Air Force are presented together to symbolize the joint nature of modern warfare. The reverse of the silver dollar features a scene representative of the courage and self-sacrifice displayed by soldiers who are awarded the medal. An infantry soldier carries a wounded comrade to safety while under enemy fire. The obverse was designed by Jim Licaretz, while the reverse was designed by Richard Masters. Maximum authorized mintage for the silver $1 coin has been set at 500,000. The coins will have a weight of 26.73, diameter of 1.5 inches, and composition of 90% silver and 10% copper. Proof and uncirculated versions of each coin will be available, with at least one mint facility used to strike each version. Sales are authorized to take place during the one year period beginning January 1, 2011.